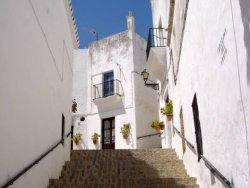 A typical Andalucian whitewashed town, Vejer de la Frontera sits on high ground about 10Km back from the long golden beaches of the Costa de la Luz coastline. 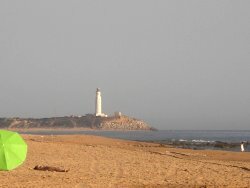 The town has plenty of history with its narrow cobbled streets, castle and turreted medieval walls, while the old mosque with a minaret bears evidence to centuries of Moorish influence. 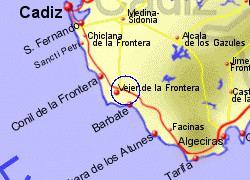 Vejer is an excellent place to enjoy a drink in one of the local bars or eat in one of the restaurants. 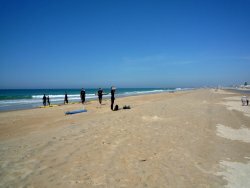 The nearest beach of El Palmar is 12Km long and never gets crowded, while 16Km inland is one of the worlds largest cork oak forests, the Los Alcornocales Nature Park. 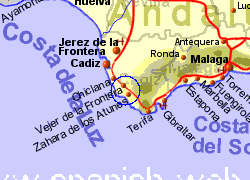 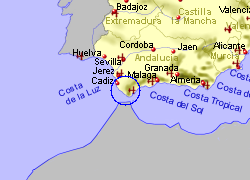 Map of the Vejer de la Frontera area.